Our publication in Journal of Cancer Research and Clinical Oncology: "Factors influencing adherence in CML and ways to improvement"
Our publication “Factors influencing adherence in CML and ways to improvement: Results of a patient-driven survey of 2546 patients in 63 countries. Geissler, J., Sharf, G., Bombaci, F. et al. 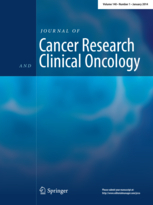 J Cancer Res Clin Oncol (2017). doi:10.1007/s00432-017-2372-z” has been a tough ride for us non-scientists over the past three years, given we needed support to do the data analysis and write a scientific paper. Our paper has been published in the Journal of Cancer Research and Clinical Oncology. We would like to that everyone who have collaborated with us in this study: Better information on the disease, medication and management of side effects, supported by haematologists, is key to improve adherence. Optimal adherence to oral cancer therapy is of key importance to maximise treatment effectiveness in patients. With the advance of molecular target therapies, cancer treatment in more and more indications is transforming from in-hospital care towards oral treatment in an outpatient setting. With cancer becoming a chronic disease, patients are often required to take the drug indefinitely on a daily basis. Ensuring an optimal adherence to treatment over the long-term period could be a challenge. As data on the driving factors of nonadherence in oncology is scarce, a pan-European workgroup of the CML Advocates Network has conducted a pilot study which has unveiled differences of non-adherence between countries, administration types and use of adherence tools in Chronic Myeloid Leukemia. The CML Advocates Network has conducted a large international study with 2546 patients from 63 countries and 79 CML patient organisations in 12 languages. It aimed to investigate motivations and behavioural patterns of adherence in CML, and subsequently support hematologists and patients to improve adherence and develop adherence tools. 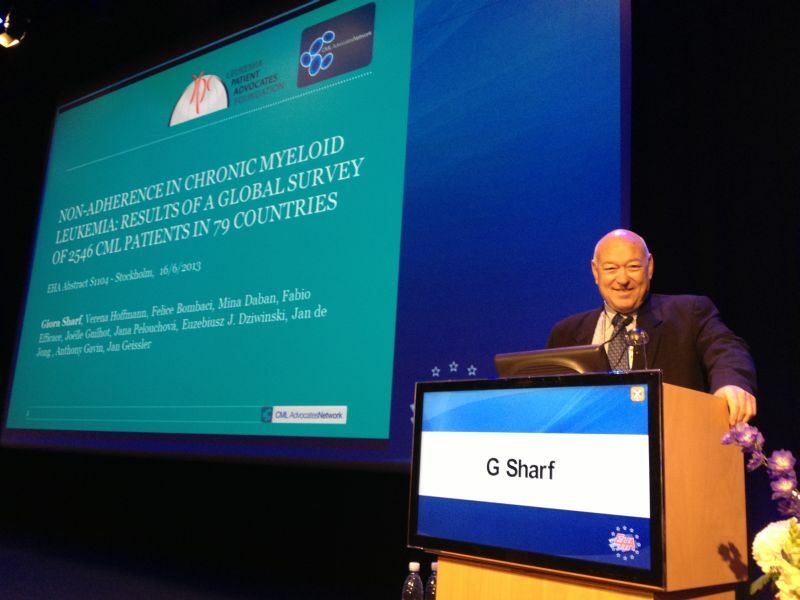 The global CML Advocates Network Adherence Survey was presented at the European Hematology Association (EHA) Congress 18 in Stockholm on 16/6/2013 in the oral session "8. CML - Clinical" (EHA Abstract S1104). Authors were Giora Sharf, Verena Hoffmann, Felice Bombaci, Mina Daban, Fabio Efficace, Joëlle Guilhot, Jana Pelouchová, Euzebiusz J. Dziwinski, Jan de Jong, Anthony Gavin, Jan Geissler. 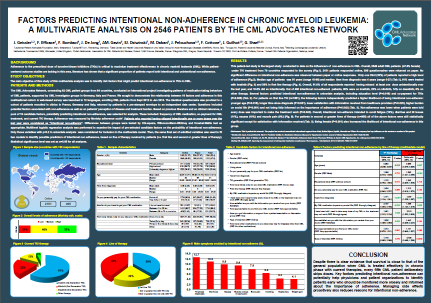 At the Annual Congress of the American Society of Hematology (ASH) in December 2013, the CML Advocates Network was presenting new results of a multivariate analysis on factors predicting intentional non-adherence in New Orleans 2013. A pan-European workgroup of the CML Advocates Network has conducted a pilot study which has unveiled differences of non-adherence between countries, administration types and use of adherence tools in Chronic Myeloid Leukemia. The pilot study has provided the groundwork for a larger global adherence study that is currently ongoing in 12 languages. The results of the pilot study were published in the Journal For Patient Compliance, Vol 2 Issue 4 (published online on 12 Dec 2012): "Adherence in Chronic Myeloid Leukemia: Results of a Patient-driven Pilot Survey, Jan Geissler, Giora Sharf". Taking medication exactly as prescribed is not always easy for many patients with chronic myeloid leukaemia. However, adherence, or taking the medication as prescribed by the doctor, is important, as it has a strong impact on the effectiveness of treatment. "Chronic Myeloid Leukemia: What you need to know about adherence to therapy" is a video that educates patients with CML about the importance of adherence to treatment. The video was developed by a European workgroup of 8 patient advocacy groups and CML experts, supported with in-kind resources from Bristol-Myers Squibb.